Falls are the leading cause of fatal and non-fatal injuries for older Americans. Recovering from a fall can be expensive, and it can even cost you your life. This is also a reason why it’s crucial to be aware of the danger and to take preventive measures. 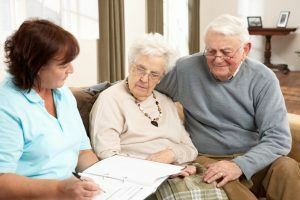 In this blog, we have listed some tips for preventing your elderly dad falls at home suggested by professional of home health care in Massapequa. Emergency Monitoring System – Keep a cordless or cellular phone within reach in the most frequently used areas of the home. Pets And Children Stationary – Children and pets have been known to cause falls and injuries by merely getting underfoot. Use seating with sturdy armrests – Sturdy armrests can make getting out of chairs more comfortable on stiff legs. Adding Slip-Resistant Tape – Grip tape can be especially useful on stair treads. Also, avoid taking the stairs in socks or loose-fitting shoes or slippers. Replace Laminate Flooring – It may be low-maintenance, but it can be pretty unforgiving in the case of a fall. And consider placing non-slip pads close to the shower or tub as possible. Mobility Tools – Try out stabilizing devices such as a walker or a car cane. Add Grip Bars – Install grip bars near beds, toilets, showers, and bathtubs. These minor enhancements can be a major convenience well before they are needed for safety. Relocate Obstacles – Clear obstacles like low-sitting furnishings, rolling furniture or loose floor coverings from high-traffic areas. Even though fixing these things, you can’t prevent your elderly completely from accidents happens, and you can’t monitor then always. So to prepare yourself before there’s an accident hiring the right caregiver for home health care services in NY is essential. They not only care for elderly but also offers health and companion care on an hourly and live-in basis.